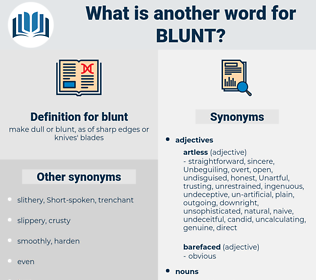 What is another word for blunt? blatant, resounding, forceful, rough, candid, categorical, flagrant, direct, crude, rude, rounded, bot, cogent, outright, sharp, coarse, head-on, sincere, strong. attenuate, weaken, mitigate, Mitigating, lessen, diminish. forthright, straightforward, brutal, outspoken, abrupt, brutish, inscrutable, honest, hard-hitting, unequivocal. subtle, needled, sharp, tactful, polite, pointed. lengthy, long, kind, nice, devious. reserved, bland, spiked, spiky, urbane, smooth, gallant, piercing, loquacious, courteous, suave, Lacerating, prickly, politic, jagged, diplomatic, mealymouthed, genial, voluble, talkative, spiny, stabbing, considerate, scratching, jabbing, spikelike, conditional, needlelike. increase, point, strengthen, assist, encourage, needle, aid, help. Phoebe's journey across the desert of Life had paused at many an oasis, and their images remained in her mind to blunt the tooth of Memory. It was a direct, almost a blunt question. petrify, break, obtund, dampen, soften, weaken, damp.